When learning to shoot handguns, the shooter must be mindful of stance and grip, i.e., how to hold the gun, sight alignment, breath control, trigger squeeze and follow-through. Each of these elements plays a part in shooting accuracy. Like everything else, shooting is a skill that needs to be developed and maintained. Like a good golf swing, knowing how to hold the gun properly plays a big part in your accuracy and gun handling proficiency. For someone that has never handled a firearm before, specifically a handgun, it is highly recommended that the individual seek out training from someone with experience in firearms training. 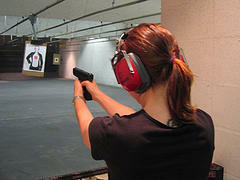 The best source will most often be a National Rifle Association certified pistol instructor. While anyone with gun handling experience may be able to effectively cover the basics of firearm safety, a new shooter may have more confidence receiving instruction from someone certified by an organization recognized throughout the world as a leader in promoting gun safety. The best trainer may or may not be the same person that teaches the local permit-to-carry class. The permit-to-carry class is not the place to learn how to shoot. When attacked by someone with or without a weapon, you will generally not have enough time to worry about your shooting stance, breath control, and grip or sight alignment. Many times an attack will happen without warning. Defensive accuracy is generally described as one’s ability to quick-fire multiple rounds from their handgun and hit a target at a distance of 21 feet while maintaining a shot-grouping within an 8 inch circle on a man-size target. The preferred aiming point is the largest center of exposed mass which in many cases is the center chest. When defending yourself, you can never predict what your shooting position will be. Therefore, learning how to shoot without the use of your guns sights would be useful as well as learning to shoot from different positions (standing, sitting, prone). It is conceivable that if attacked from the rear and being choked, it might be necessary to shoot your assailant using a free hand and pointing under your opposite armpit in order to save your life. The possible scenarios are endless and none follow a script. Training, reading and visualization through what-if scenarios can help you be more prepared.